Get an overview of EMA's regulations and market registration schemes that apply to your solar PV. Consumers installing a solar PV system should engage a Qualified Person (QP) to ensure appropriate physical installation and compliance with regulations. A Qualified Person is a person who is registered as an Architect with the Board of Architects (BOA) or a Professional Engineer with the Professional Engineers Board (PEB); and has a valid practising certificate issued by the BOA or PEB, respectively. Depending on the individual consumers’ requirements, the QP may need to seek approval from the authorities, e.g. BCA (structural safety), URA, (planning permission), SCDF (fire safety), CAAS (aviation zone) for the solar PV installation. After the solar PV system has been installed, the consumer should engage a Licensed Electrical Worker (LEW) to commission and turn on the solar PV system, including applying for the relevant electrical licences and assessing the electrical connection requirements. The consumer may also need to apply for a generation licence and market registration, if the solar PV system is 1MWac and above. c. Appoint another Market Participant (not applicable to residential consumers). For more information, please refer to the subsequent sections below on the various payment schemes and selling back excess solar generated electricity. PDF download (with hyperlinks). Refer to the table below for more details about the schemes. What are the payment schemes available for consumers generating solar energy? Simplified Credit Treatment Scheme (SCT) EMA has simplified the market registration process for Non-Contestable Consumers (NCC) to directly register with SP Services (SPS). Under the SCT, NCCs that sell any excess energy to the market will be paid at the prevailing tariff minus grid charges. Enhanced Central Intermediary Scheme (ECIS) EMA has introduced the ECIS where Contestable Consumers (CCs) can register with SP Services (SPS) directly, thus reducing regulatory barriers and administrative matters. EMA has introduced a new class of Market Participant (Intermittency Generation Sources Non-Exporting) category. 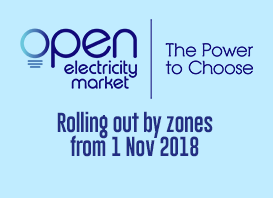 Under this category, consumers will undergo a streamlined market registration process where they are not required to provide credit support or to submit generation meter readings to Energy Market Company (EMC). Consumers will not be paid for injecting any excess energy to the grid. Consumers are required to pay EMC an estimated fixed charge on the IGS capacity only every six months. This will be based on a standardised IGS Generation Profile for all consumers. 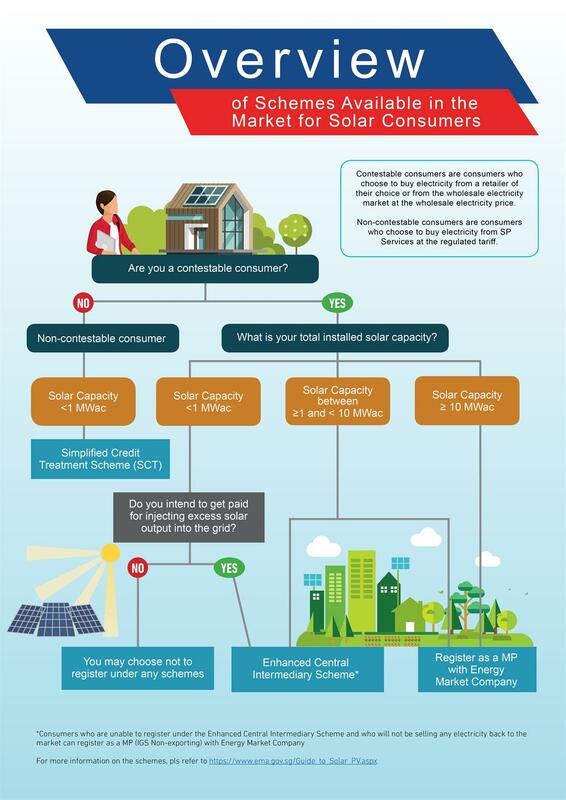 Consumers with solar installations will need to register as a Market Participant with Energy Market Company, subject to the relevant Market Rules. Any excess energy solar sold back to the market will be paid at the respective nodal price. *Contestable Consumers (CCs) are those that can choose to buy electricity from a retailer of their choice or directly from the wholesale electricity market. How to sell your excess solar generated electricity? Non-contestable consumers with embedded solar capacity < 1 MWac will need to register with SPS under the SCT to sell their excess solar generated electricity. Consumers will receive rebates via their monthly electricity bill. The Net Export Rebate application form can be downloaded from SPS’ website here and submitted via SPS e-Business portal directly or by the consumer's appointed Licensed Electrical Worker (LEW) on the consumer's behalf. Alternatively, the hardcopy application form can be submitted via mail to the following address: SP Group, 2 Kallang Sector, Singapore 349277. If you wish to receive payments for your excess solar electricity via GIRO, download the form and submit it together with the Net Export Rebate application form. For further enquiries, please email install@spgroup.com.sg. Contestable consumers with embedded solar capacity < 10 MWac can register with SPS under the ECIS to sell their excess solar generated electricity. Non-contestable consumers and contestable consumers with embedded solar capacity ≥ 1 MWac can register directly with the EMC as a MP to sell electricity . EMC will pay the MP for the excess solar generated electricity. You will also need to register as a Generation Facility with EMC. The Market Participant application form can be downloaded from EMC website here. The Generation Facility application form can be downloaded here. Please submit the hardcopy forms via mail to the following address: Energy Market Company, Market Administration, 4 Shenton Way, #03-01 SGX Centre 2, Singapore 068807. For further enquiries, please email info@emcsg.com. As part of the national drive towards greater environmental sustainability in the built environment, an advisory note on best practices for installing solar panels on building rooftops has been published, which can be found here. Find out more about how to install a solar PV system for your business or home. Learn more about the components of electricity tariff here. 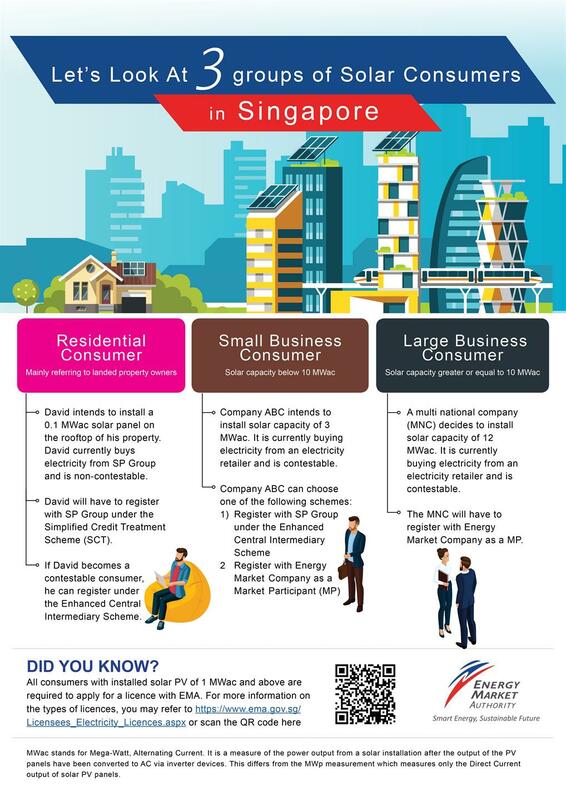 Get the latest figures for the installed solar PV systems in Singapore here. Related documents on the deployment of solar energy can be found here.